with select reading. 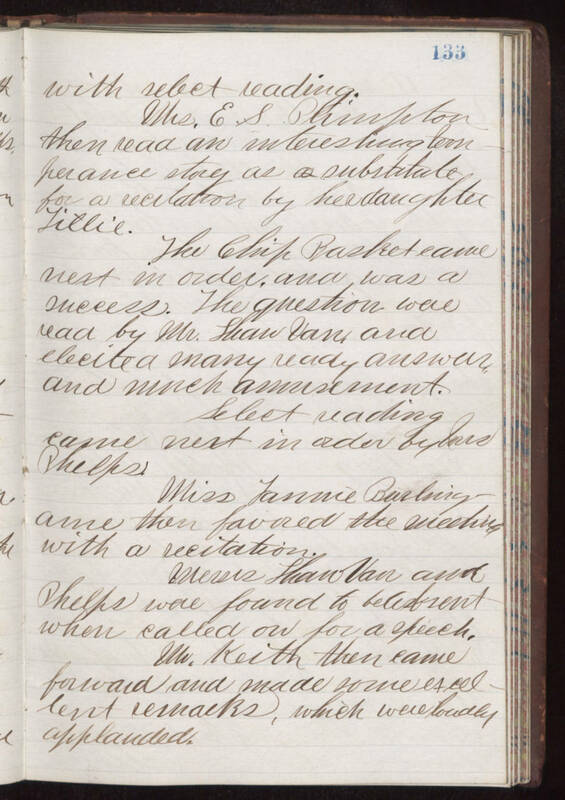 Mrs. E. S. Phinpton then read an interesting temperance story as a substitute for a recitation by her daughter Lillie. The Chip Basket came next in order, and was a success. The question were read by Mr. Shaw Van and elecited many ready answers, and much amusement. Select reading came next in order by Mrs Phelps. Miss Jannie Buckingame then favored the meeting with a recitation. Messrs Shaw Van and Phelps were found to be absent when called on for a speech. Mr. Keith then came forward and made some excellent remarks, which were loudly applauded.